The four of the five rivers after which Punjab gets its name (Chenab, Ravi, Beas and Sutlej) originate in these ranges and flow through the land. The heritage culture and traditions of the State are as fascinating and diverse as the landscape. And these can be seen in the rich variety of customs, rituals, clothes and handicrafts. 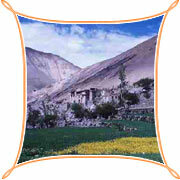 The most fascinating are the unusual customs of the Kinnauras who live in the eastern district, Kinnaur. These are a curious mix of the Buddhist practices followed in Lahaul & Spiti and the Hindu traditions in the rest of the State. At all important social functions the hereditary oracle of the local deity recites the mythology through the oral tradition of the 'chirong'. The popular folk dance 'naati' (or 'natti') of Kullu forms a part of all celebrations. Though earlier it used to be performed only by men dressed in their traditional, swirling tunics, 'churidars' (pyjamas that resemble jodhpurs) and decorated caps, accompanied by four to eight musicians, now women join in too. There are thirteen variations of the dance depending on the tempo. Other colourful folk dances include the 'karthi' harvest dance of Kullu, the exhilarating 'birsu' and 'ghugti' from the upper Shimla hills, and the 'kayang' and 'bakayang' from Kinnaur. The isolation imposed by the mountainous terrain of Himachal has permitted its people to develop their own unique tradition of handicrafts. These include the extremely ornate and beautiful silver jewellery worn by the women; richly embroidered scarves, footwear and caps; leather embroidery; beautifully patterned rugs and carpets; and woollen blankets and shawls of varying degrees of fineness. The State is also internationally renowned for the exquisite miniature paintings referred to as the 'Pahari' School which thrived during the 16th to 18th centuries. SHIMLA In the early part of the 19th century the British occupied a crescent shaped hill around a tiny village named Shymala in southern Himachal. This was developed as a retreat for British officers and slowly grew to become Shimla (2130 m), the summer capital of the British in India. Today, this charming hill station is the capital of the State and one of the most popular year-round holiday destinations in northern India. 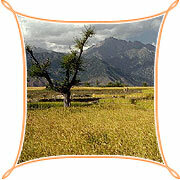 Being close to the plains of the Punjab it provides an easy get-away from the oppressive summer heat. Shimla and its environs provide splendid views of the snow-clad Himalayan peaks, fine walks through oak, pine and rhododendron, numerous pretty picnic spots such as The Glen and Chadwick Falls (a 67 m waterfall), and several quiet retreats such as Summer Hill (1982 m), Sanjauli (2257 m), Mashobra (2149 m), Kufri (2622 m) and Fagu (2509 m). No visit to Shimla is complete without climbing up to Jakhoo Hill (2438 m) which looms over the town. The steep climb is rewarding because of the fine views it offers not only of the town but also of the surrounding valleys and mountains out to the snow-capped peaks. The Hanuman Temple, dedicated to the monkey-god and built at the highest point on the hill, attracts many pilgrims.